Members of the School’s Hospitality Business Real Estate Investment Club, along with their advisor, Dr. A.J. Singh, and Interim School Director Dr. Bonnie Knutson, traveled to Los Angeles to participate in the 2016 Americas Lodging Investment Summit (ALIS) from Jan. 23 – 25, 2017. ALIS is the largest hotel investment conference in the world, with over 3,000 delegates and a wide range of seminars and panels by international hotel experts who discuss important trends and identify new opportunities for the year ahead. The conference is presented by Burba Hotel Network (BHN), whose founder and president is Jim Burba (BA Hospitality Business ’77), a member of the School’s Alumni Association Hall of Fame, Class of Developers. Arriving even before the conference began, Audrey Koutny (BA Hospitality Business ’18), Stephen Dall’Orso (BA Hospitality Business ’18), Allie Chapekis (BA Hospitality Business ’18), and Alex Salens (BA Hospitality Business ’17) from the School bonded with students from universities around the country (stuffing over 3,000 registration packets!). They then rotated volunteer shifts, assisting with registration, information desks, and breakout sessions. Each student also had the opportunity to attend various panels and workshops. The MSU students also had the rare opportunity to attend a networking event on Sunday evening with Jim Burba and fellow School graduate Jonathon Zink (BA Hospitality Business ’04), now managing director with BHN. Jonathon earned an MBA at the International University of Japan, and joined BHN after several years in hotel operations and business strategy and development. The students received one-on-one advice and attention from Jim and Jonathan in the VIP Lounge and backstage at the Microsoft Theater. Stephen Dall’Orso was grateful for the unique opportunities they had been given. 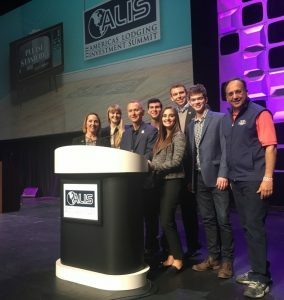 “Attending ALIS is not only valuable to those that actually made deals, but also to the future business professionals like myself that observed and learned about the importance of social factors and communication that go into this industry,” he said.